Track 1: Sean Keane (fiddle). Lads of Laois , Dr. Gilbert, Lord Gordon, reels. The Home I Left Behind. Track 4: Jackie Daly (accordion). Her Mantle so Green(slow air). Track 5: Cian Talty (pipes). Track 6: Louise Mulcahy (flute). Down the Broom, The Bush in Bloom (reels) . Track 8: Tara Breen (fiddle). Track 9: Mick Crehan (whistle). May Bán, and The Last House in Ballymackea, (hornpipes). Track 10: Conor Keane (accordion). Track 11: Mikie Smyth (pipes). Track 12: Caitlín Nic Gabhann (concertina). Track 14: Billy Clifford (flute). Peter Wyper's and The Wonder (Hornpipes). Track 15. Sean and Cian Talty, with Caoimhín Ó'Raghallaigh (pipes and fiddles). Track 16: Bobby Gardiner (melodeon) with Mick Mulkearns and Mairéad Casey, dancing. Hand Me Down the Tackle, The Heather Breeze, Miss McLeod's (reels). Track 1: James Kelly (fiddle). Track 2: Moss Landman (pipes). The Leitrim Bucks, Jenny Picking Cockles & Travers' (reels). Track 3: Claire & Breda Keville (concertina & fiddle) . Track 5: Paudie O Connor (accordion). Track 6: Siobhán Hogan (flute). Track 7: Caoimhín Ó'Raghallaigh (fiddle). Track 8: Gavin Whelan (whistle). Bean Dubh a' Gleanna, Ambrose Moloney's (air & reel). Track 9: Páidí Mhárthain Mac Gearailt (song). Track 10: Denis Liddy & Vinnie McMahon (fiddles). 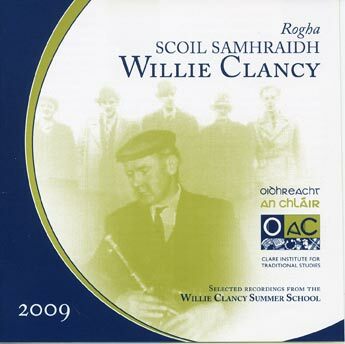 Willie Clancy's and Kitty Sean's (flings). Track 11: Ciarán Somers (flute). Track 13:Mary Ellen Curtin (concertina). Track 16: Charlie Harris (accordion) with Mick Mulkearns and Mairéad Casey, dancing. The tracks presented here are selected from the full range of events organised over the week-long summer school in July 2009. They were recorded live and in all cases the performances were intended for the benefit of the audience present and the performers were not aware of any intention to publish. The performers on these CDs are amongst the world’s finest exponents of the traditional arts. OaC would like to thank them for the generous donation of their performances, without which the CDs could not have been produced. © All rights reserved. OaC are not aware of any copyright on the material on these CDs other than as indicated. If other copyright has been infringed we will be pleased to hear from the holders.